Synopsis: A tragicomic challenge to the changing face of post-1980 Turkey, changing values, the old order and the new, Muhsin Bey holds up an unforgiving mirror to society. The film is framed around the relationship between Muhsin Kanadikirik, a music organizer of advancing years, committed principles and scant achievement, a man as passionate about classical Turkish music as he is abhorrent of Arabesque and resistant to the march of the times, and the young Ali Nazik, a wannabe folksinger of penetrating voice from Turkey's south-east; a premise founded on collision. In Muhsin Bey, which he wrote as well as directing, Yavuz Turgul leans less towards intercultural dialogue as towards cultural clashes. What is more, he employs the most effective formulae of 'old' and 'new' Turkish cinema to craft a highly engaging presentation of the clashes. The friendships, betrayals, love affairs and unexpected twists flood to the screen in the manner of a Yesilçam classic, but at the same time service a quite different narrative. 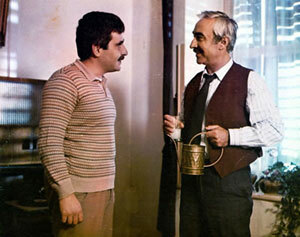 With outstanding performances by the two leads, Sener Sen and Ugur Yücel, who offsets his accomplished counterpart flawlessly throughout the film, Muhsin Bey approaches life's 'winners' and 'losers' from a sociological angle and takes on the mantle of a thoroughly entertaining, impressive farce in the process. By association Ali Nazik, the upstart who storms to stardom the easy way, is Yavuz Turgul's ultimate loser. Interestingly, there is also a palpable documentary feel to the film. Witness, for example, the naked realism of scenes in historic Beyoglu, the backstreets, the music halls and singing contests.. And it is this that makes the film one of the most striking examples in cinema of the relationship between place and person. fragman izle mek isteyenlerin sitesi. MAVI BONCUK CHANNEL. Powered by Blogger.